The euro continued its bearish slide lower yesterday ending the forex trading session as a wide spread down bar making it 7 sessions in a row, and, more importantly, breaking below the critical 200 day moving average which sits at USD1.3121. The euro was given a minor boost this morning following comments from ECB Chairman Trichet who confirmed that the ECB would continue to buy bonds, calming market fears that the Irish problems would spread to Spain and Italy. In addition better than expected Chinese manufacturing data also helped to calm equity markets thereby moving investors towards the risker side of the pendulum. 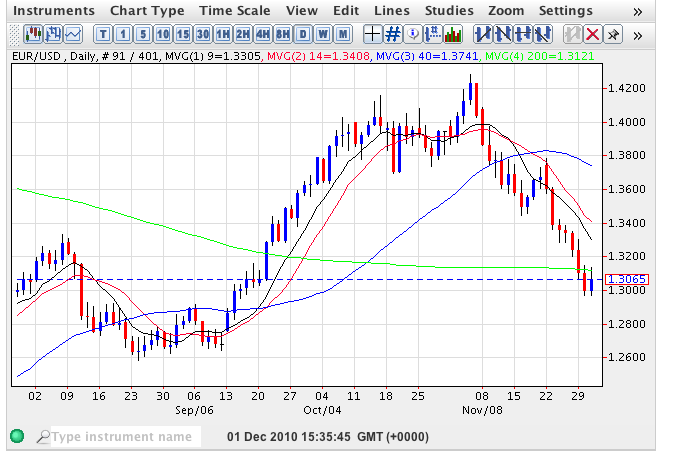 It is interesting to note, however, that the high of today’s trading session at USD1.3137 appears to have run into resistance at the 200 day moving average and should this be the picture at the close of the US session later today then this would suggest a further bout of euro weakness is likely. Below the current price action we have a deep area of price congestion which extends from USD1.2919 to USD1.2608 and this could provide a platform of support in due course and prevent a further decline for the euro vs dollar. However, should the lower level of this area be breached then we can expect to see the euro to dollar decline further and possibly move as deep at USD1.20 in the medium term. Much, of course, will depend on the fundamental picture and should contagion spread to Italy and Belgium then this has the potential to accelerate the decline in the euro and we could even see a collapse in due course. As mentioned in previous posts the view from Goldman Sachs is that a fair value for the euro vs dollar is at USD1.20. Most interesting item of fundamental news today has been the ADP figures in the US which came in better than expected at 93k against a forecast of 70k, providing us with an important perspective on the likely non farm payroll numbers on Friday. These are forecast to come in at 143k against last month’s 151k but given today’s number may surprise.